Watson Knowledge Catalog lets you manage your data from every angle. Working with Watson Knowledge Catalog on IBM Watson gives you a 360-degree view of your data so you can create models, uncover insights, and enable your teams to collaborate more effectively. Watch this short overview video. Find and discover data across multiple on-prem and cloud sources to unlock tribal knowledge and catalog new sources wherever they sit. Control access to governed data assets with automatic policy enforcement, intelligent data cataloging, and enterprise-grade regulatory compliance. Increase collaboration and accountability through a self-service, governed, data-rich experience that auto-guides users to the most relevant data for their task. 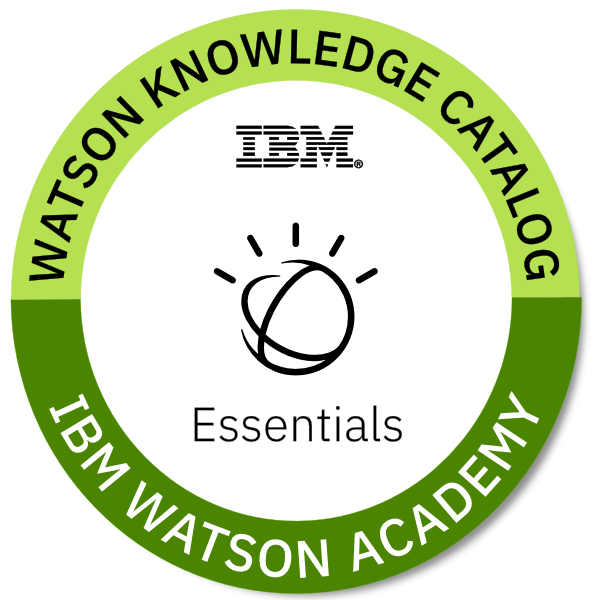 If you’re using Watson Knowledge Catalog, consider earning the Watson Knowledge Catalog Essentials IBM Open Badge to share verified proof of your achievement. Additional Watson Studio badges are available for Watson Studio Essentials, Visual Recognition, Streams Flows, Dashboards, Data Refinery, and Watson Machine Learning.